Moderntone was made by Hazel Atlas as early as 1935 in the transparent colors, and later followed by the opaque colors (on platonite glass) with decorations and in pastels. For more examples of the platonite, refer to the moderntone pastel section. The predominant color in this pattern is the cobalt (or Ritz) blue. A complete dinner set with all serving pieces can be assembled in blue with some perseverance. Serving pieces include round bowls, platters, creamer and sugar as well as salt and pepper, and an unusual marmalade with metal lid. Tumblers can be found in green and pink fairly easily, and normally are between $8 and $12, while the blue sells for $15 to $20. 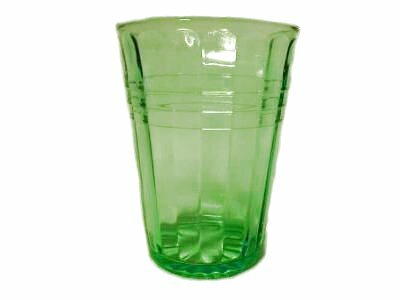 Tumblers can be found in a few different variations, ribbed (or optic) and sometimes with a Florette bottom. If you find a miniature shot glass size, it belonged to the 'Little Deb' child's set. Currently, crystal is the only color reproduced in this pattern, and that consists of the dinner plate, the 10" plate and a cake plate. These are easy enough to spot, as they are marked 'Mexico' in the glass. Learn more about Hazel Atlas Glass at the Official Website, along with hundreds of pictures, pages, and price values. 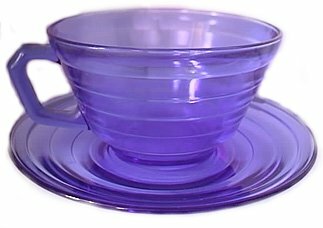 Above is a cup and saucer, which usually sells in the $15 range. Although not difficult to find, it is rarely seen in any other color than the Ritz blue. In some cases, a sailboat transfer is found on blue moderntone, and may be seen under the ships pattern. Do you remember using Hazel Atlas Glass items when you were a child? Join our free newsletter and share your stories with other collectors and members of the Hazel Atlas Glass website.